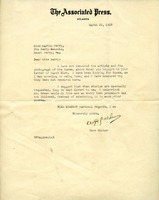 Martha Berry wishes to thank Mr. Small for writing an article in the Atlanta Constitution about Mr. Ford's gift to The Berry Schools. Mr. Ford has gifted some buildings for the Girls School but the buildings are not endowed, so the school is still in need of money. Miss Berry also mentions that the school has been given the wrong kind of publicity before from the Rome paper and that she is very grateful for his article as it entered into the spirit of the situation in a wonderful way. 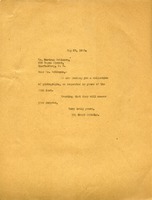 The Berry Schools sends a letter with a collection of photos to Mr. Robinson as he requested. 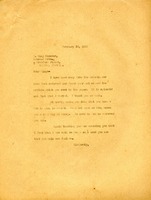 Bertram Robinson writes to Miss Berry to ask for a picture of herself and maybe one of the Berry school buildings. Robinson wants the picture to put it with an article in a large national newspaper syndicate. The article would appear in 500 newspapers throughout the nation. This is a letter from Retail Credit Company to Berry Schools regarding an order of 100 copies of "Inspection News." 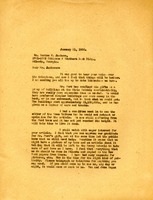 Stephens, the editor of Company Publications, explains what will be sent when the article comes off the press and the details of the postage permit. 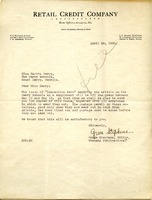 An article in "The Golden Book Magazine" about the Berry Schools, pleading for donations. 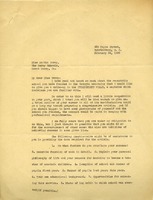 Letter to K. Wheeler from the Berry Schools. The letter says that the Berry Schools will be sending pictures to Mr. Wheeler for the article he is publishing about them. 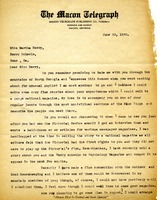 Adelle Ausley asks Martha Berry for an article that she read about her in the Pictorial Review, and asks for any other descriptive documents that help to describe her. She is making a collection of "Georgia stories" to be used in Georgia schools. 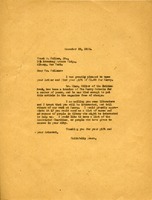 Martha Berry writes to Mr. Jackson saying that it was wonderful to hear his voice on the phone and that she sent him all the literature they have. She explains that Mr. Ford only gave them the buildings and several cars and trucks. She says that they're still suffering from the Ford boom and the editor of the Rome Tribune won't retract the article. 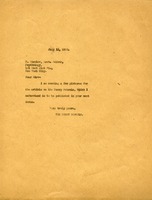 She says that she is looking forward to his article and tells him that she will help him with whatever he needs. 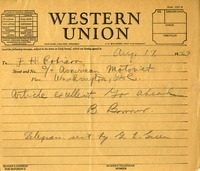 W. F. Caldwell writes to Martha Berry to inquire after an article and photograph of a horse which he has yet to receive. He was counting on using them and wonders why, after she mentioned them in her previous letter, that he has yet to receive them. 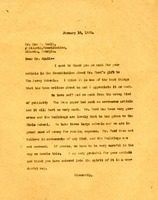 He is sorry that Mr. Green did not follow procedure, causing the article and photograph to not be received. 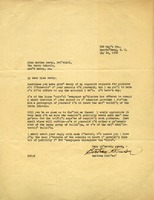 B. Bonner tells Mr. Robinson that the article is excellent and to go ahead with it.